Are you looking for inspirational lectures and classes? Are you looking for uplifting Services? Are you looking for Youth programming? Are you looking for community festive meals? Are you looking for a meaningful and inspirational Rosh Hashana? If the answer is "YES" to any, then we have something for you! 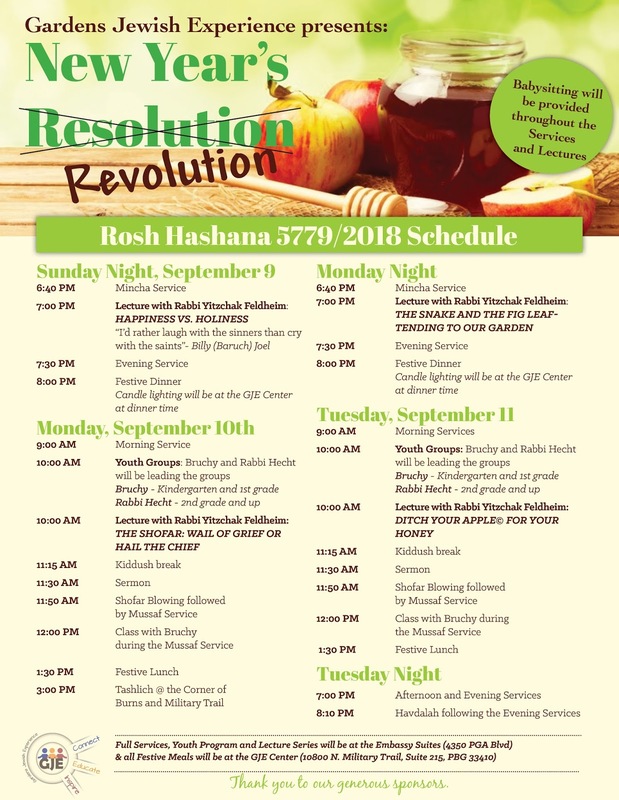 Please join us and experience Rosh Hashana with the Gardens Jewish Experience at the Embassy Suites Hotel (PGA & Military) in Palm Beach Gardens. Suggested donation is $180 per family. However, everyone is most certainly welcome. As the High Holidays are just around the, our Rabbi's tell us that it is apropos and meritorious to enhance our repentance , prayer and charity at this time. Thank you to all those families that have sponsored thus far.